Attorney Mica Lee Williams spoke in support of Pittsburgh's Paid Sick Days Act, which state courts have blocked from taking effect, outside City Council chambers on Thurs., Feb., 15, 2018. The city of Pittsburgh is continuing its battle at the Pennsylvania Supreme Court over two laws that could affect local workers, but that lower courts have so far blocked. One of the laws would require businesses to offer paid sick time to employees, and the other would place new training requirements on security officers in many of the city’s buildings. 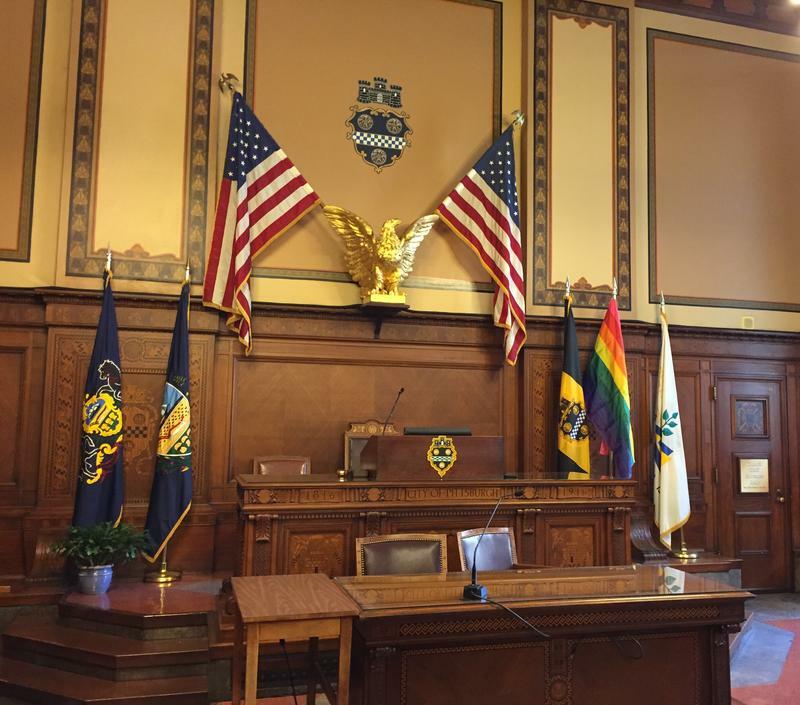 Pittsburgh City Councilmember Corey O’Connor announced at a media conference Thursday that more than 50 supporters submitted a brief in support of the city with the state’s high court. Until now, lower courts have ruled that state law bars the city from imposing the regulations at issue on private businesses. But, city officials and grassroots organizers told reporters Thursday that the rules would promote public health and safety, which the city may police. Paid sick time off, they argued, will prevent workers from coming to work when they become ill and potentially exposing others to disease. The new training rules would require security officers who work in many buildings that are 100,000 square feet or larger to complete emergency training by schools certified by the Pittsburgh Fire Bureau. Given the regularity of mass shootings such as the one Wednesday at a school in Broward County, Fla., Pittsburgh City Councilmember Ricky Burgess said it’s important to ensure security officers are prepared to respond to emergencies. O’Connor noted that the case is significant for local governments throughout the state. Attorney Mica Lee Williams, a legal fellow with New Voices for Reproductive Justice and Women’s Law Project, added that mandated paid sick leave would be especially beneficial for women of color, who account for a disproportionate share of low-wage workers and single parents. Women of color, Williams noted, often hold service jobs in public places, with heightened risk of exposure to contagious diseases. Under the paid sick days law, companies would be required to give employees an hour of paid sick leave for every 35 hours they work, though businesses with fewer than 15 workers could cap the amount of paid sick time at three days per year. The smaller businesses would also be exempt from paying for sick days during the first year of enforcement. Larger employers would be required to offer workers at least five paid sick days each year, as soon as the law goes into effect. Mayor Bill Peduto also spoke at Thursday’s media conference. He encouraged employers to offer paid sick time on a voluntary basis. They could put stickers on the doors of their businesses, he suggested, to notify customers they offer this benefit. Several restaurants in the city already have such policies in place, according to Jordan Romanus of the Restaurant Opportunities of Pittsburgh. Romanus said they include Bar Marco in the Strip District, Black Forge Coffee House in Allentown, Scratch Food & Beverage in Troy Hill, and Mixtape in Lawrenceville, among a few others. According to Romanus, no restaurants in Pittsburgh offered paid sick days when his organization was first established five years ago. The Pennsylvania Restaurant & Lodging Association and the Building Owners and Managers Association of Pittsburgh brought the lawsuits against the two laws before the state Supreme Court. The justices have consolidated the cases. It's not known when they'll issue a ruling. 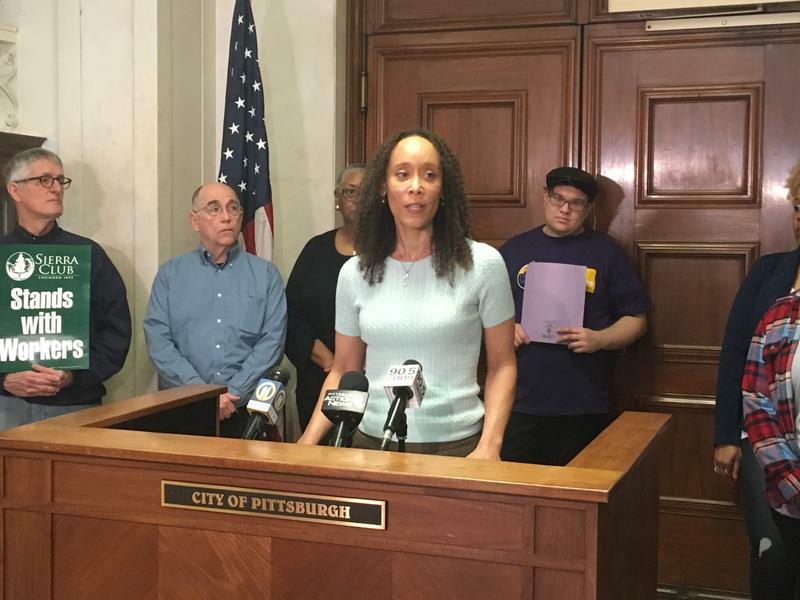 The city of Pittsburgh is preparing to defend two laws that would impact local workers – one requiring private employers to offer paid sick leave, and another creating new training requirements for security officers in many city buildings. The Pennsylvania Supreme Court recently decide to hear cases challenging the laws early next year. So far, the city has lost in lower courts because, the courts found, it does not have the authority to impose these regulations on businesses. After 14 years of being designated "financially distressed," on Monday the city of Pittsburgh exited Act 47 state oversight of its finances. State officials hailed the city's return to fiscal good health. 90.5 WESA's Kevin Gavin spoke with Pittsburgh Mayor Bill Peduto about the city's financial future. Last month, the Pennsylvania Office of Open Records ordered the City of Pittsburgh to release its bid to become Amazon's second headquarters. Mayor Bill Peduto said at the time he'd fight the ruling, even if it meant going to court.